Although we’d like to assume that asbestos exposure is athreat of the past, the reality is that occupational asbestos exposure is still alegitimate risk for workers in dozens of different industries. Each state now imposes its own set of asbestos regulations for industrial jobsites, but workers do still face the possibility of coming into contact with previously existing asbestos and have the potential of becoming at risk of asbestos-related diseases such as mesothelioma. When asbestos was still being used as a key ingredient in most industrial products, more than 3,000 items were manufactured with the mineral. These asbestos-containing materials (ACMs) often remain in place today, and current industrial workers may risk disturbing them when they go about their work. Once asbestos has been released into the air at a jobsite, it can be easily inhaled or ingested. The jobsites are often poorly ventilated, causing the asbestos to circulate in the air for an extended period of time. Since the fibers pose a health threat once they are friable (easily crushed), the best way to avoid asbestos exposure on a jobsite is to prevent the fibers from even being released into the air. Even the most basic occupational duties can cause asbestos to enter the air. Scraping, cutting, chipping or replacing asbestos-containing products can disperse the fibers. More aggressive work – including knocking down walls or drilling through asbestos-containing insulation – is equally likely to release the fibers. To prevent the fibers from becoming airborne during a project, many occupational safety groups recommend wetting ACMs before conducting any sampling or removal work. 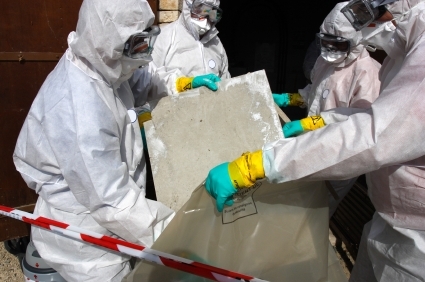 Specific methods and detergent solutions are described in more detail during asbestos training classes; these classes are required for any employees who work with asbestos. Employers are required to pay for these classes as well as yearly renewal classes. Asbestos training also explains that the risk of occupational asbestos exposure can also be reduced by appropriate safety gear. HEPA-equipped regulators and separate work clothing should be worn any time an employee steps into an asbestos-contaminated jobsite. Any debris that is released during work on an asbestos-contaminated jobsite must be disposed of properly. Asbestos materials must be sealed off in appropriate bags and brought to a landfill that accepts asbestos-containing waste. Before the jobsite is designated as safe, it should also be vacuumed with a vacuum equipped with a HEPA filter.